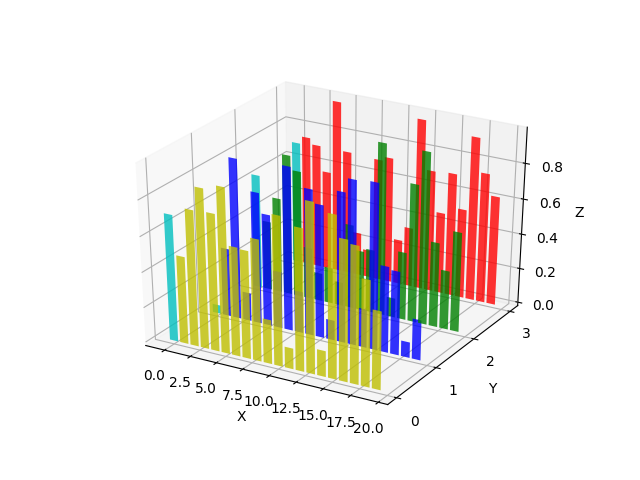 Demonstrates making a 3D plot which has 2D bar graphs projected onto planes y=0, y=1, etc. # Generate the random data for the y=k 'layer'. # xs and ys. To demonstrate this, we color the first bar of each set cyan. # Plot the bar graph given by xs and ys on the plane y=k with 80% opacity. # On the y axis let's only label the discrete values that we have data for.